On Wednesday May 7, 2014, at 6 a.m., Metro will latch the Avalon station of the Metro Green Line. The Los Angeles County Sheriff’s Department (LASD) will provide advance notification and customer assistance at the station from Monday, May 5th through Tuesday May 6th between the hours of 6 and 9 a.m. and 3 and 6 p.m.
Metro Green Line stations already latched include Redondo Beach, Douglas, El Segundo, Mariposa, Aviation/LAX, Hawthorne/Lennox, Crenshaw, Vermont/Athens and Harbor Freeway. Metro plans to latch the four remaining Green Line Stations by the end of this month. All Red/Purple, Blue and Gold Line stations equipped with gates are now latched. Once all latching is completed, 40 of 80 rail stations will be latched; Metro staff are studying whether to add gates at some existing and future rail stations. 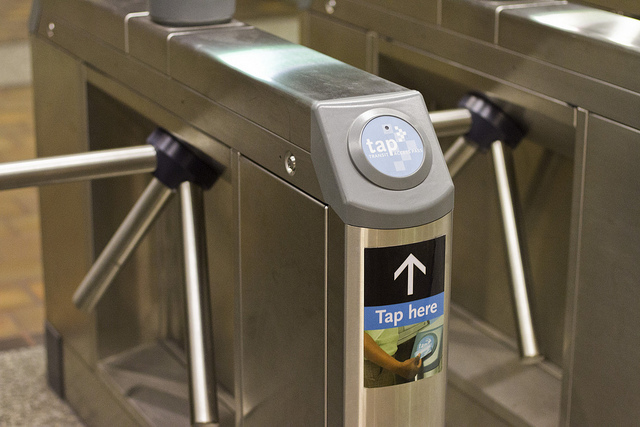 Once gates are latched, turnstiles will not allow a rider to enter the station unless a TAP card with an appropriate fare has been tapped at the gate. Explain why Metro needs to study how to add gates to FUTURE rail stations? Isn’t it a no brainer that you design all future stations with gates in mind before construction is set to begin, during the planning stages? Please keep gating every station you can. In other news, “Harry Potter and the Gates of Avalon” would be a great book title. The Blue Line Station platforms had to be lengthened costing millions each because they built them to short. How concrete blocks cost millions is beyond me.